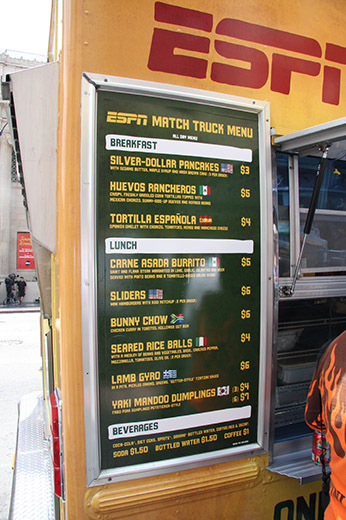 ESPN and chef Roy Choi have teamed up to create two World Cup-themed food trucks that'll be hitting the streets of LA and NYC all throughout the global football tournament. Choi, the mastermind behind Kogi BBQ, designed the truck's menu, which features dishes from some of the countries taking part in the World Cup. The truck also boasts a giant flat-screen TV, so football fans can watch the games while they eat. We hit the LA World Cup truck on Friday during the France-Uruguay game. 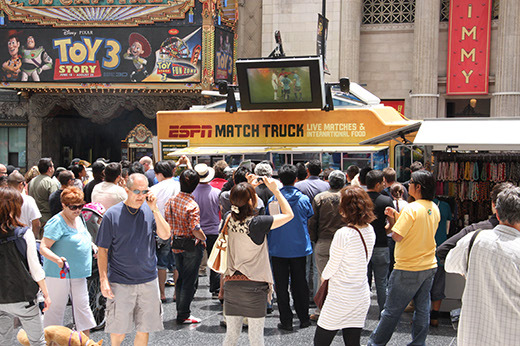 It was parked outside the Kodak Theatre on Hollywood Boulevard, right in the heart of tourist town, and there was a sizable crowd gathered around the flat-screen. Roy Choi was, alas, not on the truck, but I talked to PR guy Mark, who told me the menu will be the same throughout the truck's run. I thought it'd be nice to have a revolving menu featuring different countries' dishes - perhaps the menu could even change depending on which countries advance in the World Cup - but that'd probably be far too complicated to manage. 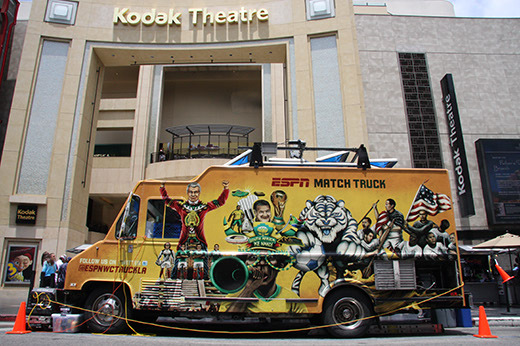 ESPN's Match Truck won't be hitting standard LA food-truck destinations like Miracle Mile: it's focusing on places where crowds like to hang out and take in a game, rather than just eat and go back to work. Yesterday it was back on Hollywood Boulevard, and today it visited Macarthur Park. Pershing Square and Olvera Street are also on the schedule. 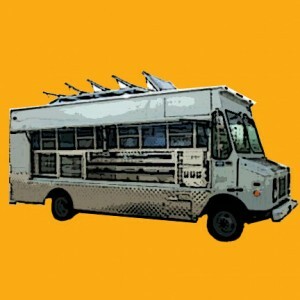 The truck's Twitter feed will let you know where you can eat and watch, as will the Web site. Interestingly, all four of the dishes we ordered were sprinkled with sesame seeds. The seared rice balls (Italy: $4) were perhaps my least favorite - they didn't taste of very much at all. The salad that went with them, though, was fantastic, full of crunchy green beans and radishes, with a vinegary dressing. The mozzarella tasted a lot like queso fresco. 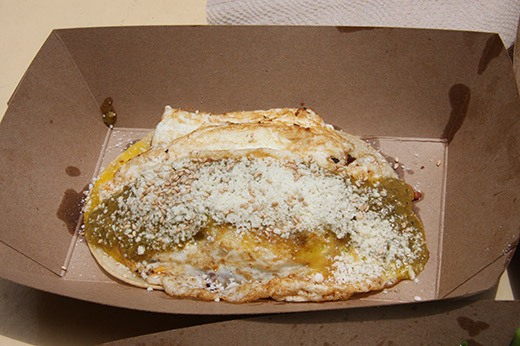 As I've previously mentioned, I am a spice wuss; the huevos rancheros (Mexico: $5) were slightly too hot for me, though the flavors were very good. I think it was the chorizo that set my mouth on fire. The egg whites were perfectly textured - tender near the yolks, and crispy on the edges. PR guy Mark showed us a stain on his shirt where the yaki mandoo dumplings (South Korea: 3 for $4, 6 for $7) had attacked him earlier in the day, and I dodged a similar salvo of juice as I bit into one. They were soggy, but otherwise awesome. I wished I'd ordered six instead of three. 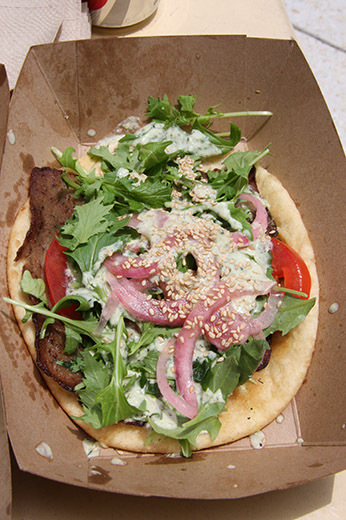 The lamb gyro (Greece: $6) came with what the menu called "gutter-style" tzatziki sauce. I'm not sure what that means, but I do know that the sauce was seasoned with a metric ton of dill. I liked it. The pickled onions were a great touch - they gave me a stomachache later, but it was well worth it. 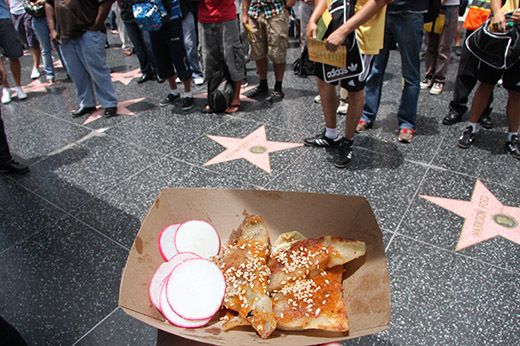 Los Angeles Magazine's recent cover story noted that LA's food truck street culture helps us feel more connected to one another in this car-centric city. Add a football game to the equation, and that connection strengthens severalfold - at least for me. I truly enjoyed standing on Hollywood Boulevard in the sunshine, in the middle of a crowd, eating squirty dumplings, staring up at the Match Truck's screen and chuckling at the French teenagers screaming "Allez les Bleus!" behind me. I'll be back to repeat that experience at the Match Truck very soon.